Auroras: What is the Solar Connection? We know that the solar wind is the power source for auroras. It has also been known for a long time that there is a connection between activity on the Sun and auroral activity on the earth. The following graph shows how historically, measurements have suggested sunspots and auroras might be related. 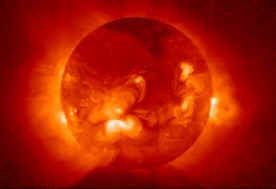 X-ray image of the Sun from the Yohkoh satellite. Lightest colors show the areas of most intense activity. The Sun and its wind are constantly changing. The flow of particles and the intensity of the solar wind's magnetic field increase when the Sun is more active. Scientists now know that certain kinds of high-energy solar events can result in very large and unusual auroras. These types of solar activity include coronal mass ejections (CME's) like the one pictured here, and sudden solar flares. In these events, parts of the Sun's outer atmosphere practically explode, producing huge bursts of solar wind packed with as many sub-atomic particles as a mountain! Above: A coronal mass ejection (CME) bursts from the Sun at the location of 8 o'clock. The dark disk on the SOHO spacecraft masks out the light from the solar disk. The small white circle shows the actual size of the solar disk. Right: Flare on the Sun's surface, imaged by the TRACE satellite. Flares are very sudden, high-energy events, which eject large quantities of mass in a matter of a few hours. It takes 2 to 4 days for solar wind and particles to reach Earth. When these events arrive, they strike the magnetosphere like a shock wave and inject huge amounts of energy into the magnetic field, often causing enormous and unusual auroras. We will also see that such intense "gusts" of solar wind can affect where auroras can be seen. Artist's conception of a solar shock wave acting on the magnetosphere. 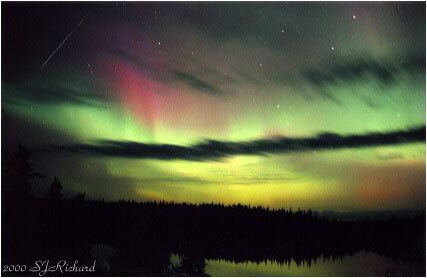 Aurora photographed in Ontario during a solar-geomagnetic storm.